Song and sound travel with me, in my memory and in the wind chimes outside the kitchen window. I have settled in Santa Fe for a bit. I’ve found a wonderful casita, this one large enough to live in for a while. 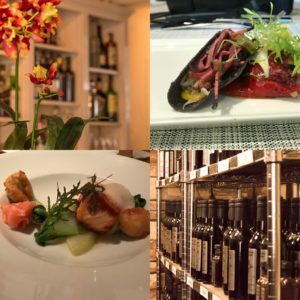 It is in the country, just eight minutes from the plaza, but in a different direction than the AirBnB where I first landed, and more affordable. There is a master bedroom, bath and walk in closet; a kitchen/family room with a fireplace; and an office/bedroom with a second bath. I’ve moved some of my things from storage into this casita. It’s interesting to be reunited with some of my possessions since I am not in a possessive state of mind. 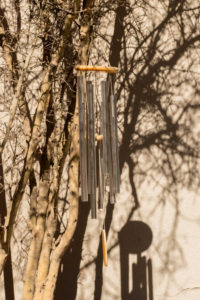 Which brings me to my wind chimes. To some degree, whatever came out of the storage pod is what I have. I have some things that I truly enjoy; others are still somewhere in a box. It doesn’t matter. I have enough. One box I happened to open contained several sets of wind chimes. Not my favorite Maine chime whose sonorous voice is that of Mt. Desert Island harbor buoy. That chime gongs mightily in a deep wind, and although its sound pleases me, it may not please others. But my three other wind chimes appeared and I have them strategically placed. One which lived in my former garden is now outside the kitchen window. I love its soft lilting chime and because it’s small, it readily sings. The larger chimes that used to live on my front porch are again on my front porch, welcoming everyone who enters. And the chimes that once hung on the trellis outside my bedroom, are again outside my bedroom window. They hold memories of lying in bed during chemo, listening to the birds, wanting to be well. Every morning and night they accompanied me and they do so again. Timeless music to my ears; past and present; the wind moves with me. Or perhaps I move with the wind. Either way, we find ourselves together in a new place. Santa Fe is a fascinating town. It’s healing cultures run deep; its depth of thought is far ranging; and the artistic presence is second to none. It’s beautiful, soulful and welcoming. 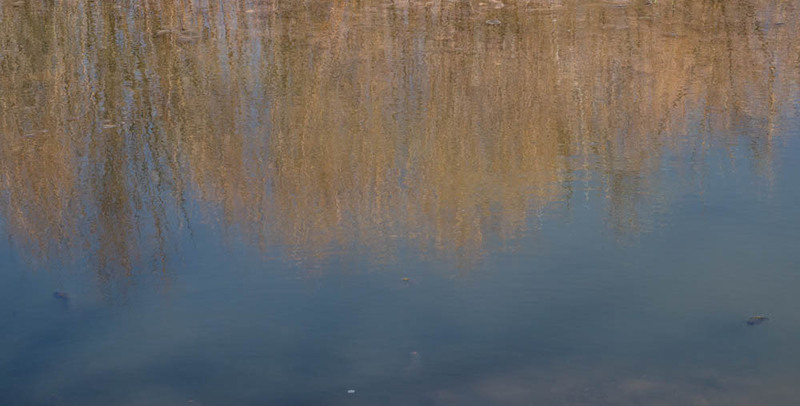 It’s a perfect place to launch CancerRoadTrip. And it’s restaurant per capita ratio is outstanding, a fact not lost on me. There are seemingly endless places to explore, in town and in the general area. More culinary travels to follow. But back to Santa Fe, where I’d like to share some of my healing adventures. One is a recent visit to Ojo Caliente. 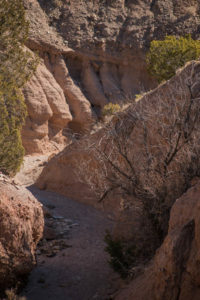 Click here for a picture gallery of Ojo Caliente! It was a cool day; the temperature would reach the fifties, and a wind was forecast for the next day. Indeed, I watched as lenticular clouds lined up on the mountain ranges, presaging a change in weather. A front that would bring some much needed moisture was on its way. But today, it is fairly still. I arrive at Ojo Caliente with a new Santa Fe friend, and we set off to hike before submerging ourselves in the mineral waters. The walk to the trailhead passes a wooden fence, a coyote fence, typical of this part of New Mexico. But on this fence balance sets of stones. And stacks of stones appear here and there throughout the hike to the top of the mesa. I have no idea what they symbolize, but they seem to provide a sense of companionship and community as they share our trek. 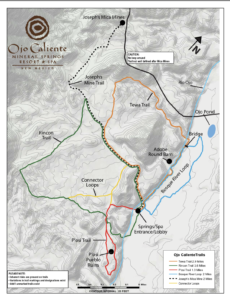 Ojo Caliente has a rich Native American history of being a gathering place. For centuries people have come to the mineral waters to heal mind, body and spirit. It’s located at the base of a spectacular rock formation. Pools with varying blends of waters, minerals and purposes tuck into the base of the cliff. 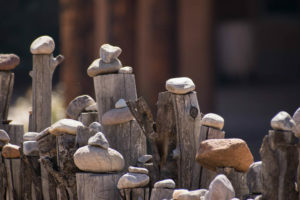 There is something ancient and earthy about Ojo Caliente. And it is the stuff of legends, as well as the location of past civilizations. Before entering the spa, it is time for a hike, to the P’osi Pueblo and back, and then up the river and back. Both are beautiful, but if you have to choose one, and can navigate the steep, rocky terrain, you want to visit the Pueblo site. The initial climb is a bit steep and requires sure footing, but it’s not that far, and after that, the path levels off. I have my Urban Poles, a gift from the company, that help me navigate the landscape. Deep gorges carved by water wind along the path and the flat expanse of the arroyos beckons for exploration. The mountain top plateaus and here is where the P’osi Pueblo once stood. The Pueblo was built using many of the same methods as the Taos Pueblo. You can click here to get a visual image of that community. This was one of eight Pueblos along the Rio Grande during the fourteenth and fifteenth centuries, and it was estimated to have had 10,000 inhabitants. 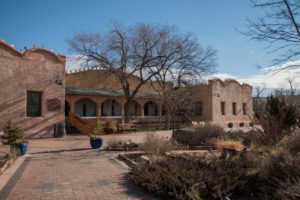 The Pueblo was believed to be three stories, with 2-3,000 rooms. The Tewa, descendants of prehistoric people, lived here for two hundred years before an epidemic forced them to move. They disappeared just before the Spanish arrived searching for gold. The stories of the Tewa people say that this is the Pueblo where the Summer and Winter people came together, and farmed the lush, fertile valley of the river, growing cotton, corn, beans and squash. 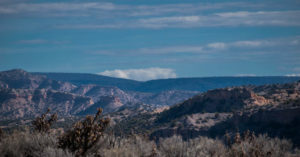 “Tewa” includes the people of the Taos, Santa Clara, Okhkay Owingeh (San Juan), Santa Clara, San Ildefonso, Nambe, Pojoaque and Tesuque Pueblos who all share a common language. Summer and Winter people refer to the two groups of Tewa that traveled the Rio Grande and the Rio Chama. When they reunited, they built Posiouinge. Literally translated Poseouinge (P’osi for short) becomes “village at the place of the green bubbling hot springs” or it is also referred to as the “Greenest Pueblo”. It is a sacred place. The Pueblo was originally sited on the mesa overlooking the river, but today, nothing of the building remains, but scattered over the mesa are chards of pottery dating back hundreds of years. This sacred land is a modern day archeological treasure. 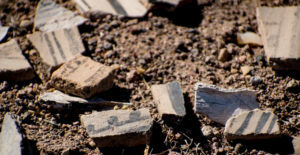 Chards of pottery litter the old Pueblo grounds. For me, the site had a very personal feel. The various chards of pottery conjured up images of women creating and decorating the vessels for everyday use. Who were they? What actually happened to them? Where are their descendants? The road along the river, even in winter, is stunning. But it is time to spa. Warm mineral water from deep in the earth pours into the Arsenic Pool. The Arsenic Spring helps with arthritis, stomach ulcers and to heal a variety of skin conditions. 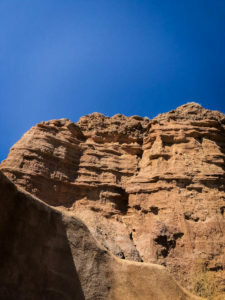 It is tucked into the base of towering cliffs, whose coloring changes with the angle of the sun. The Lithia Spring is believed to relieve depression and aid digestion. The Soda Spring addresses digestion. It is housed in a small house that offers silent soaking and contemplation. The Iron Spring is, of course, rich in iron, to bolster the blood and immune systems. The warm water bubbles up through a natural pebble floor that gives beneath your feet. A Native American legend has the large rock in the pool is guarding the spring, to be sure it remains accessible to everyone. The Mud Pool Slather yourself with mud, bake until dry, soak and rinse! The mud is said to pull toxins from the body. 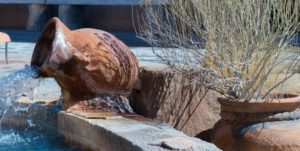 Over 100,000 gallons of water bubble up through the Ojo Caliente Mineral Springs daily, ranging in temperature from 80 up to 109 degrees. Pool hop, slather yourself in mud, or book any of the spa services. Choose from a Native Blue Corn and Prickly Pear Salt Scrub, a Milagro Relaxation Wrap, or a more typical range of spa pleasures. Whatever one decides, it is a good choice. 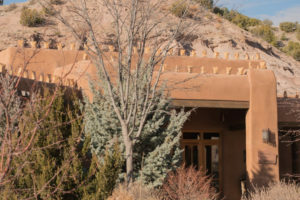 Ojo Caliente is a unique blend of spa indulgence and earthiness. It retains the sense of connection to the earth, wind and time. It isn’t overly glitzy and it certainly isn’t manufactured. Yet it offers a full range of spa services, in addition to the mineral pools, and a restaurant and wine bar. There is also lodging available. And believe it or not, I did not try the restaurant (this visit). My friend’s husband’s home smoked some extraordinary salmon, and we indulged in smoked salmon wraps pool-side. 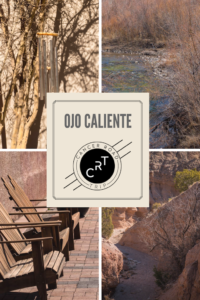 Ojo Caliente has passes for locals that bring the cost of a visit down to under $20. If you bring your own towel and robe (and you are welcome to do so), it’s not a budget breaker. But it certainly is an indulgence. One you should seriously consider should your healing travels bring you this way.